In so many series the second book is a huge let-down. Siege and Storm? An exception. It is a squillion times better than Shadow and Bone... I adore the writing - it's so lyrical, so beautiful, yet so modern and witty and funny. I love this blend of classic fairytale and modern day. And it always seems to leave me wanting more! And the plot was amazing too. It was just nonstop action, nonstop thrills, nonstop suspense and nonstop excitement. I gobbled it up, falling harder in love each time. And then having my heart totally broken. Numerous times... I didn't see ninety-nine percent of the twists coming and could have just read this three-hundred-odd-paged-book in one sitting! You know, if I didn't need sleep and food and stuff... -- The Book Addicted Girl * GUARDIAN TEEN BOOKS * Wow, wow, wow - that's all I can say. 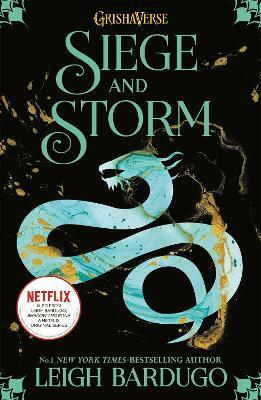 Siege and Storm only confirms that Leigh Bardugo is a must-read author for all teenage bookworms and fantasy fans! Set in a beautiful and magical fictional land, the novel draws you in with its vivid imagery and unique array of characters... If you haven't entered the world of Grisha yet, then why on earth not?! I mean, you know a novel is superb when words fail you and you just can't coherently speak anymore... right? * FEED ME BOOKS NOW * Leigh Bardugo, you sure know how to involve your readers and make them an emotional wreck. Siege and Storm is an enthralling sequel that seriously ups the game and expectations of the reader. It is written so beautifully that is flows flawlessly while keeping the magic alive in the readers mind. If you want to read a fantasy series that has a truly unique world then read this series. * READ WRITE AND READ SOME MORE * I wrote a piece here gushing about why the Grisha series is so different and so special. There are many small reasons that all come together to create the awesomeness. But there are also many more that I can't even explain. Maybe it is different because it is just magic. It has the most exquisitely constructed world, the best-written characters, the most amazing writing and storyline. And it always always always leaves me desperate for more. It always leaves me aching, foaming at the mouth, for more: right now. And that, perhaps, is why it is so special. It is magic. It is beautiful. It is perfect.